My name is Joann Baker and I have been working as a Voluntary Registered provider for over 12 years. I provide part-time, full-time, before/after school care and drop-in childcare for ages 6 weeks to 12 years. 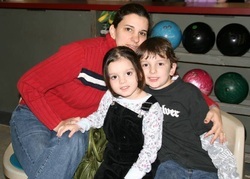 Although I have been doing childcare for 12 years in Fauquier County, I have over 22 years of experience with children. My in-home childcare is conveniently located in the town of Bealeton, VA. I offer a clean and nurturing environment, toilet training (when age appropriate) and a family friendly community in an upscale neighborhood. As a registered provider I am subject to unannounced home inspections by the state of Virginia. Every adult that is age 15 or older living in the home undergoes TB testing and multiple state and local background checks including FBI fingerprinting. This ensures a safe environment for your child and is required by the state of Virginia. These checks are performed every time I renew my license. I also attend annual training classes for childcare providers to improve the quality of care and education for every child in my care. As a voluntary participant in the states USDA food program, I provide breakfast, lunch, two snacks and milk to each child. Participation in this program ensures that your child is getting well planned, well portioned meals and snacks daily. What you can expect from me is to care for your child every day. I will maintain a professionally clean and friendly environment that consists of daily educational and fun activities. Your child will make friends and learn new things in a friendly environment. Some of our weekly activities will include painting, coloring, show and tell, puzzles, Spanish, story time, and learning numbers, letters, shapes and colors. We will also be singing, dancing and having a lot of fun with music! I understand how hard it is to leave your children in someone else's care, but I am confident that you will feel comfortable with the love and attention that they are receiving. My daycare is the next best thing to home. I will keep you informed and ensure that your child is happy and comfortable in my care. I also have excellent references that will be provided to you when you come and meet me! What a great place for your child to make new friends and have some fun!